The first part of this series of posts showed how small differences in average pay increases over time can explain much, if not most, most of the wide spread of income growth cited as evidence of income inequality. The question addressed in this part is whether the historical record supports this assertion. Part Three, in the queue, will look at some realistic options for addressing rising income inequality. 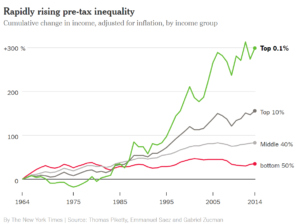 A recent New York Times article contained a chart showing growth in pre-tax income, adjusted for inflation, over the last fifty years (using available data from 1964 to 2014), and for four different segments of the economy. As you can see, the path is not so nicely geometrical as the chart in Part One but after about 1985 the four groups began to diverge, and wound up in a similar place to our simpler example when tracked over 30 years. Note that this data is tracking cumulative changes in total income by income group, and it does not represent the same people throughout the period, as people come into and out of the income groups. And so this is not quite the same population dataset as my earlier example, but the mathematical compounding math, the Rule of 72, is similar. This chart shows the last convergence of cumulative income growth rates being about thirty years ago, in the mid-1980s. The highest gains shown since then, shown the green line representing the richest one out of 1000 people, would be equivalent to about 8% in consistent annual income growth from 1985. You can see that this growth was much higher in some years but showing sharp declines in others. The red line, representing the bottom half of the population, mostly the poor and those in the lowest-paid jobs, shows less than 1.5% in annual compounded growth in pre-tax income, after inflation, in those last thirty years. The middle 40%, mostly skilled trades and white collar jobs, is represented by the light-gray line, and comes out to about a 3% growth rate averaged over that time. Finally, the next 10% income group shown by the dark-gray line represents mostly upper business management and the most highly-paid occupations. This group’s income growth can be replicated with approximately a 6% average annual growth rate over thirty years. A second factor is the level of inflation. While very low in recent years, the 1970s saw persistently-high annual inflation in the U.S. peaking at almost 14% in the last year of that decade. Labor unions were also stronger at that time and many employers implemented a “cost of living adjustment” that kept after-inflation wages more stable. While managerial salaries largely kept pace as well, companies had less ability to bump wages significantly beyond that level. In short, the Rule of 72 really kicks in to the benefit of higher-tier earners (counter-intuitively, I think) when inflation is under control and the economy is stable. The first condition has been true since the early 1980s, and the second has weathered a couple big down periods to come out stronger today. This stability has clearly had the impact of spreading out the different economic tiers, even if you assume no big global conspiracy to control lower-tier wages. Indeed, this reality is a hint to possible economic policy alternatives for addressing income inequality. The key takeaway from this second part of this three-part series is that the real world data in the U.S. mirrors what would happen in different economic tiers had just slightly different average income growth rates over a long period of relative financial stability. Part Three will look at the potential effects of the newest tax legislation (spoiler: they’re overblown and poorly-reported), some of the proposed causes to income stagnation, and what might be done to change those conditions. Stay tuned for Part Three. Bookmark this page in your browser or click on the Twitter or Facebook icons at the top-right of the screen to follow this blog. Leonhardt, David. “A Tax Plan to Turbocharge Inequality, in 3 Charts.” The New York Times, 17 Dec. 2017. Aaronson, Daniel; Mazumder, Bhashkar. “Intergenerational economic mobility in the United States, 1940 to 2000”. The Journal of Human Resources, Winter 2008.. I will also note that labor unions not only scored gains for their members, but these pay gains usually served as the base for raises to non-union employees as well. This was my personal experience while working for Ford Motor Company in the 1970s. The union would settle their contract, and then the non-union workers, such as engineers, accountants, I.T. staff, and clerical workers would receive similar changes to pay and benefits, including a cost-of-living adjustment in those high-inflation years. Truman F. Bewley has made an interesting argument about this. Employers don’t cut wages during a recession because the cost savings would be more than offset by high turnover of the most-valued employees, and by lower productivity overall. Bewley, Truman F. Why Wages Don’t Fall during a Recession. Harvard Univ. Press, 2007. Part Three is now posted.